Abe Hiroaki was born in Aichi prefecture and graduated from the Naval Academy in 1911. He was also a graduate of the Naval Staff College (1925) and commanded destroyers, cruisers, and battleships in the period 1925-1938. 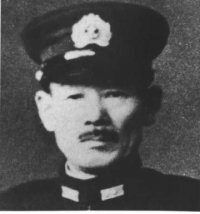 Promoted to rear admiral in 1938, Hiroaki began the war as commander of Cruiser Division 8, which accompanied the Pearl Harbor attack force. As second ranking officer in the force, he commanded the detachment that covered the second Wake invasion attempt. He also briefly relieved Nagumo as commander of the Japanese carrier forces following the debacle at Midway. Abe continued to command cruisers and battleships during the major carrier battles of the Guadalcanal campaign, serving as commander of Combat Division 11, which was composed of Battleship Division 3 and Cruiser Division 8. Abe led the Japanese bombardment force during the first Naval Battle of Guadalcanal, where the Hiei was crippled by Callaghan's cruiser force and further battered by aircraft from Henderson Field the next day. Abe himself was wounded in the battle. Subordinate commanders claimed that Abe send a large volume of contradictory orders during the battle. An Imperial Navy Court of Inquiry concluded that Abe erred in not reversing course long enough to reload with armor-piercing shells, and he was forced to retire from the Navy in early 1943. Yamamoto was reportedly furious at Abe for scuttling the battleship rather than letting it act as a diversion from an approaching Japanese transport force. Hiroaki has been described as a good follower but poor independent commander, lacking in determination and imagination.